If you happen to come across some ice at Olympic Village Square over the next several weeks – don’t worry – winter hasn’t come early. 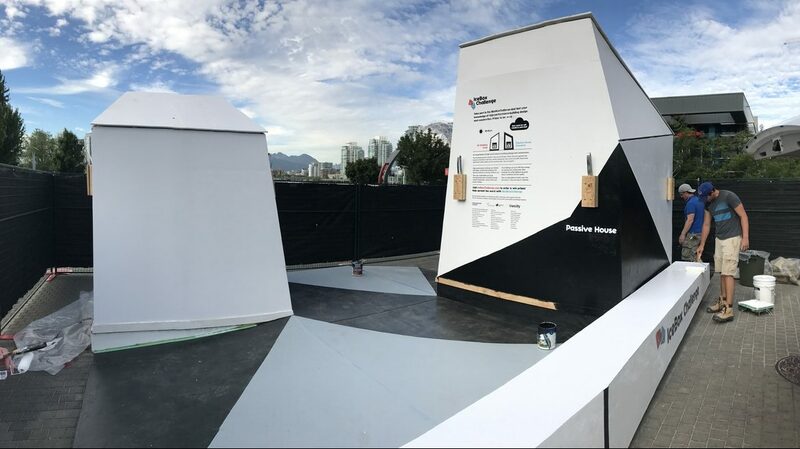 The two enormous blocks of ice, weighing nearly a tonne each, are there as part of the BC Passive House Ice Box Challenge, launched today by Passive House Canada, Vancity, the City of Vancouver, and the Vancouver Park Board. Men work to install the Ice Box Challenge Passive House over the enormous one tonne block of ice. Each block of ice has been placed in its own structure – one built to BC’s current building code, the other built to an energy-efficient Passive House Standard. 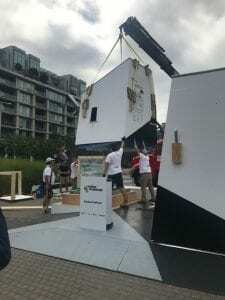 From July 27 until August 14, the structures will weather the elements and the public is invited to guess how much ice will be left in each house at the end of the competition. “If I had to guess, I would say that the ice in the regular house will be completely melted within 10 days, and the Passive House ice will never fully melt,” says Alexandre Hebert, the Zero Emissions Building Manager at BCIT. Alex has a bit of an unfair advantage though, because he helped with the construction of the structures at the BCIT Burnaby Campus. BCIT was well-suited to help with the construction of these unique ice houses, as the Institute is home to the BCIT High Performance Building Lab — an innovative hands-on learning space that teaches students about the construction of energy efficient buildings. “The high-performance Passive House structure was built to the same standards that we teach in our five-day Passive House Tradesperson Training course,” says Alex. So it’s not hard to see why BCIT is quickly becoming the BC leader in hands-on training for the growing high-performance building industry. Thank you for your coverage of this public demonstration of a high-performance building standard. Wish I came across this while the contest was still on. How many people actually modeled it? The #IceBoxChallenge for 2017 has ended. Congratulations to first prize winner Alex Yakovenko and runner-up Bernadette Zuniga, and thanks to everyone who entered. John: BCIT was not involved with the modelling so I am not 100% sure of the answer. I believe it was modeled once.